Parenting can be tough. This is no secret. Sometimes our babies experience discomfort from teething, constipation, colic, gas, or are just plain fussy. And it can be difficult to know what to do to make it better. I know those moments—they are filled with feelings of anxiety and helplessness. Also, in those moments you are quickly looking for and trying to research the best products to help you help your baby. If you’re like me you’re looking for quality products—organic, preservative-free, and highly rated. This is especially true when it’s something for your child. Well, I know of a company that checks all of these boxes that provides great products to help during those moments of panic. That company is Wellements. You may have used some Wellements products. Since they are readily available at Walgreens, Amazon, Kroger, Whole Foods, and most local grocery stores. But you may not know who they are, or how all of their products can help you and your baby. Wellements is a group of committed parents and activists who wanted to provide better product choices for families. They gathered researchers, developers, educators, scientists, physicians, and innovators, all with the passion to create products and information that could truly help mothers and Mother Nature equally. In addition, with time and a lot of hard work they have been able to develop products that truly ease a baby’s discomfort, and provide supplemental vitamins and minerals, all while easing parents’ worried minds. Also, they deliver only certified organic and preservative-free products for families that are all bottled in glass (no plastic bottles) — which we love! Essentially, they are parents supporting parents by providing everything they can to help. Listed below are some common discomforts babies experience as well as an organic, quality solution below each issue that can help! Honestly, one of the things we love about their line of products is that all of their products are free alcohol, parabens, dairy, soy, dyes, artificial colors, artificial flavors, or preservatives. Your poor little baby might be constipated and having a hard time passing regular bowel movements. This is no fun for anyone. Also, it’s common especially for babies that are formula fed and when introducing solid food. Something that can help move things along is Baby Move. This product has been designed to help occasional constipation and promote regular bowel movements. I like that it’s gentle and safe for infants and toddlers. In addition, it includes beneficial prebiotics, and does not include any harsh laxatives. Their ingredients are: filtered water, organic prune concentrate, organic vegetable glycerin, citric acid, and chicory root fiber (prebiotic). Also, it’s USDA Certified Organic, Non-GMO Project Verified, gluten free, vegan, and kosher. You’ll be so grateful to have Baby Move to help things move along! These issues are extremely common in newborns. If you notice that your baby is experiencing frequent gas, constant fussiness, and is difficult to soothe, Organic Gripe Water can help. Guess what? Now Wellements has a Nighttime version of their Organic Gripe Water. All of the same great benefits of Organic Gripe Water but with added passion flower extract and lemon balm to help promote peaceful sleep. Also, both the Organic Gripe Water and Organic Nighttime Gripe Water are USDA Certified Organic, Non-GMO Project Verified, gluten free, vegan and kosher. Babies are born with virtually untouched systems and their first exposure to bacteria happens as they pass through the birth canal. While they receive their first “inoculation” during birth, giving your baby probiotics early on can ensure they receive the beneficial bacteria they need to properly colonize their intestines with healthy microflora. Giving the Organic Probiotic Gripe Water to your baby can set the stage for good health as they grow, strengthening digestion and building a strong immune system. This product is great as a daily probiotic supplement for newborns or as a gripe water. It can help relieve occasional stomach discomfort due to colic, gas, fussiness and hiccups as well as help your baby develop healthy and strong digestive and immune systems. How quickly will it work? Every child is different but usually anywhere between immediately to 20 minutes after administering for a fussy baby. I like that their probiotic is safe and can also be used as a daily supplement to help strengthen baby’s overall health. Also, it’s USDA Certified Organic, gluten free, vegan and kosher. Teething is no fun, but unfortunately, it’s a necessary evil that all babies must go through. Some babies show no sign of discomfort (amazing!) while other babies can experience drooling, rashes, diarrhea, fussiness, low-grade fever, or the urge to chew on everything. Luckily Wellements has a one-of-a-kind Organic Baby Tooth Oil available that is gentle on baby’s tiny gums. This oil is NOT homeopathic and contains NO belladonna or Benzocaine, which is a common ingredient used to numb gums. This Organic Baby Tooth Oil is made using very carefully selected high quality oils to help make teething happy for your little one. When you’re ready to give to your baby, first, wash your hands thoroughly. Then, use your fingertip to apply a small amount of oil directly onto your child’s gums. Reapply as needed every 1-2 hours. You and baby will be so grateful! Organic Baby Tooth Oil is USDA Certified Organic, Non-GMO Project Verified, gluten free, vegan and kosher. Not being able to breathe clearly and easily is no fun for anyone. Finding an organic, gentle, and safe product is what we need. Wellements just launched a brand-new product that can help soothe your little one! New Product: Organic Baby Chest & Foot Rub! Wellements’ Organic Baby Chest and Foot Rub gently soothes your little ones, especially at night, with the calming scents of eucalyptus and lavender oils. Just rub this on your baby’s chest and feet before baby takes a nap or before bedtime and you will notice your little one experiencing some much-needed easy breathing. Organic Baby Chest and Foot Rub is USDA Certified Organic, gluten free, and kosher. We can’t wait to try it! 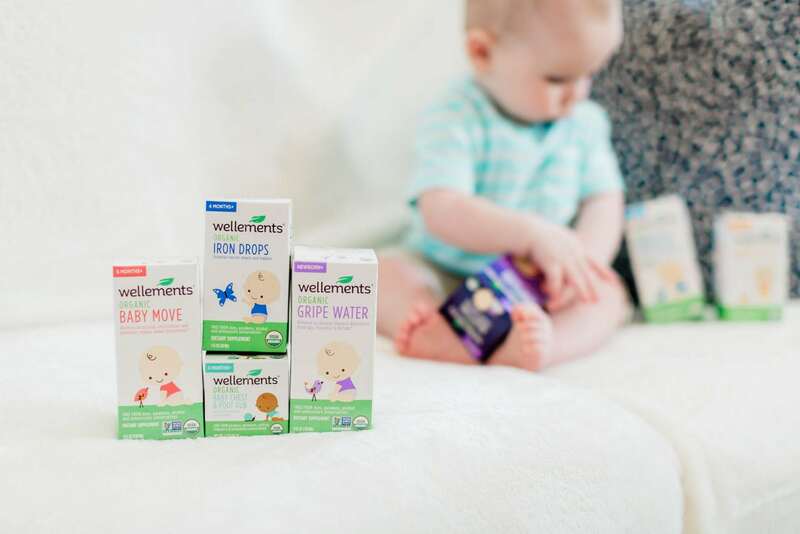 We’re so grateful for companies like Wellements that create safe, organic, and effective options to keep our babies and children feeling healthy and happy! To find Wellements at a store near you, checkout their store locator!